Gibson has unveiled a new signature guitar, the 1965 J-45 The Donovan Model. 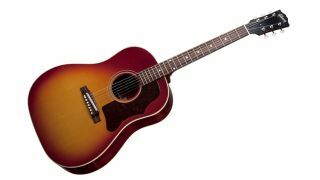 Renowned for his work in the '60s, singer-songwriter Donovan has worked with Gibson to create the guitar, a '60s style J-45 which features a Sitka spruce top, mahogany back and sides, cherry sunburst finish and a bridgeplate mounted LR Baggs Lyric microphone - basically, the working acoustic troubadour's dream. The Donovan Model has a pricetag of $2999, which in the grand scheme of things is pretty good going for a beautifully spec'd vintage style acoustic of this calibre. Gibson continue celebrating 120 years of making top quality instruments by releasing the 1965 J-45 The Donovan Model. This is the guitar that helped make the folk singer a legend. The Donovan Model comes with a mahogany back and sides, and a Sitka spruce top in Cherry Sunburst, with a 60s style radiused body. For those times when you need to plug in, The Donovan Model comes with a bridge plate-mounted LR Baggs Lyric microphone. The J-45 dates all the way back to 1942 and is nicknamed "The Workhorse," and The Donovan Model is no exception. It comes with a custom hardshell case with a plush-lined interior, made to withstand a grueling road schedule. As an added bonus each guitar comes with autographed label, and a personal letter from Donovan himself. Fans of the J-45 appreciate the smooth playability of the neck, and newcomers will love it as well. The mahogany neck and rosewood fingerboard is simply a songwriters dream. Strings: Gibson Light Guage .012" - .053"